Who are the 2018-19 Boston Celtics? That's the question this team came into their matchup with the Dallas Mavericks trying to answer - inconsistent, perhaps even entitled - or just slow to warm up to a "new" pecking order in the rotation? The Mavs came out strong, winning the tip and Wesley Matthews nailing a trey off a Luka Doncic assist just seconds into the contest. 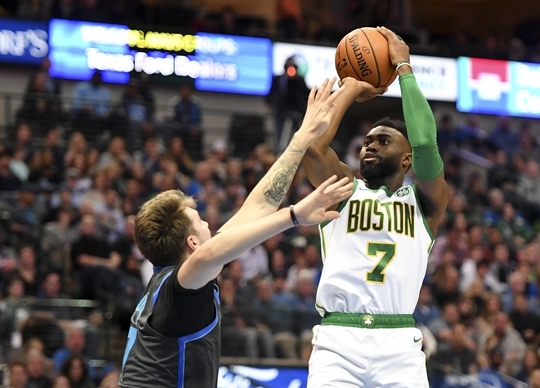 Marcus Morris and Jayson Tatum quickly evened it up, but Doncic and Harrison Barnes hit threes of their own to give the Mavs an early six-point lead. Al Horford and Tatum kept Boston close until Matthews and Doncic began to heat up, aided by a DeAndre Jordan dunk, putting the Mavericks up 25-14 with about five minutes left in the frame. Jaylen Brown and Marcus Smart joined Kyrie and Jayson in chipping away at that lead, cutting it to 32-26 Dallas to end the frame. The second frame began with a Dorian Finney-Smith tip-in, followed soon after by a JJ Barea make that extended the lead back to ten. Smart and Terry Rozier flirted with making a run, and an Irving tip-in cut the lead to just five briefly, but a Barnes trey kept Dallas up multiple possessions as the half wound down. Jaylen cut the lead to four on back-to-back plays, but Luka answered back, pushing the lead to seven before Kyrie and Mook cut the lead to just three to close out the first half Mavs 59, Cs 56. The second half opened with an oop from Barnes to Jordan, the latter nailing a layup and threatening to give the Mavs some separation until the Jay Team combined to cut the lead back to four at the nine-minute mark. The two teams kept things close until Jaylen started to heat up, and Tatum would take the lead on a dunk with 5:30 left to play, putting Boston up 74-73. The lead would not last long, however, with Devin Harris and DeAndre splitting a pair of trips to the charity stripe before Harris would connect from beyond the arc to push Dallas' lead to four. Smart's unusual luck from deep continued in an odd way, getting fouled on a three-point play, converting all of them, but Maxi Kleber hitting a more conventional three-pointer and a trip to the foul line for Jordan gave Dallas back its cushion, the Mavs leading at the start of the final frame, 87-82. The fourth quarter began with a Tatum bucket that cut the lead to three, though Harris responded with a make of his own on the next play, adding a trey soon after. Both teams seemed as if they were trying to outdo each other with sloppy play, as a series of turnovers made for some ugly viewing, until Smart got himself to the line with 8:30 to go. Last year's Celtics team was so good at maintaining trust after things went wrong. This year's team has not shown that same talent. Kleber helped the Mavs defend their lead, and rookie Jalen Brunson pushed it to 98-88 with a make at the seven-minute mark, and a trey by Barea threatened to ice the game for good, with Dallas up 103-90 with under six minutes to go, and a Matthews three all but confirmed it. A Tatum three-pointer and a Brown layup cut the lead to eleven with 3:30 left, but Wesley hit another shot from deep, and DeAndre another oop; despite the late-game heroics of the Marci making it interesting, the Cs fell to Dallas 113-104. At least, for now, the 2018-19 Celtics are a team that might not make, and doesn't deserve, a postseason berth - at all.